It’s that time of year again, time for Carl’s annual RIP Challenge (Readers Imbibing Peril). It sure doesn’t look or feel like fall outside but maybe a little gothic, a little psychological horror and a little laughter will help me ignore the oppressive heat and thick humidity. I will be undertaking Peril the First, which means reading four books between now and October 31st. Northanger Abbey by Jane Austen. A nice fit for RIP as I continue my reread one Jane Austen a year endeavor. It’s been a Very Long Time since I have read this book and the details are so fuzzy that it will be almost as if I have never read it before. Plus, thanks to RIP, I have read a good many gothic novels over the last several years and hope to find this so much funnier than I did when I read it a Very Long Time ago. The Other by Thomas Tryon. This is a NYRB and Bookman has read it before and he is certain it will give me nightmares. Well, it might. Just looking at the cover and reading the description gives me the creeps, but that’s good, right? Twin 13-year-old boys, a quaint New England town, an ancestral farm, a recently dead father. This book just might put the “P” in peril! The Infernals by John Connolly. This is a sequel/follow up to The Gates which took place on Halloween. It featured a boy named Samuel Johnson and his dachshund named Boswell. This time an angry demon is after Samuel for his part in foiling the invasion of Earth by the forces of evil. The fourth book, well I’m leaving it open for the moment, a wild card. It might be one of the other RIP readers finds something so good I want to read it too. Or maybe I will give The Green Man by Kingsley Amis a whirl – part ghost story, part moral fable, part comic novel. Or maybe I will find myself in the mood for some short stories by Daphne Du Maurier or H.P. Lovecraft. Who knows! The challenge starts now. First up for me will be Northanger Abbey. I will very likely start it in a day or two. Ooh. these are some nice picks..,maybe not the John Connolly, his books are good but his writing style doesn’t work for me. But The Other sounds super good, and Northanger Abbey is a genius pick for something a little light hearted for this challenge. Thanks NIsh! I’ve only ever read Connolly’s The Gates and found it amusing and I think The Infernals is done in the same vein so I don;t know what any of his other books are like. With that and the Austen you can probably tell I am a horror wimp. I really might have nightmares reading The Other! You have to try and squeeze in a story or two by Daphne du Maurier! Don’t Look Now is really excellent as is The Birds (and not much like the movie!). I’m curious about The Other–it is on my own wishlist so I look forward to hearing what you think of it! It is hot and nasty humid here, too. I thought of finding a good horror/scary story set in the Arctic–and I still may–to help me think cool thoughts! Danielle, I will try! I have The Don’t Look Now collection so it wouldn’t be hard to do. Here’s a cold horror suggestion for you: The Terror by Dan Simmons. Takes place in the arctic, is really creepy, and will definitely make you feel cold. Great way to celebrate fall (when it does come around) and that fourth book is so tantalizing as to what to choose….hope you have some brilliant reading. Hi Ruth! You are so kind! I hope you have fun with the RIP Challenge. It’s always great to see what books other people are reading. I get so many good ideas. Here’s a challenge I can sink my teeth into! (You know…like in vampire?) I crack myself up. I really do. Anyway, think I’ll give this challenge a try. Autumn is the best time of year, and Halloween is my favorite holiday. However, it will not feel like Fall here until November, but what the heck. Grad, you are too funny 🙂 I love Halloween too and fall and RIP has come to be a harbinger of the season. I know that cool crisp days and chilly nights are on the way, eventually. Can’t wait to see what you decide to read! I don’t think I’m going to officially do the challenge but I am going to try and read only gothic/scary/fall-themed books now through October. I’m reading A Discovery of Witches which is totally silly but fits the theme! I hadn’t heard of The Other but I think I must add it to my list! I’ve had Northanger Abbey on my Kindle for awhile… maybe time to dust it off as well. Fourth book… the new one by Diane Setterfield? Is it out yet? wherethereisjoy, silly is ok in my book. No way will you catch me reading Doctor Sleep. I still have nightmares from watching the movie of the Shining no way am I going to read a sequel! The Other will be creepy enough. Amazon says Setterfield’s new book isn’t out until November. Good suggestion though! Northanger Abbey is my favorite Austen, and I bet it’s much better when you have knowledge of classic Gothic novels (which, sadly, I don’t). I hope you enjoy it! cheryl, I just started it this morning on my commuter train and giggled and smirked my entire ride. A good sign! 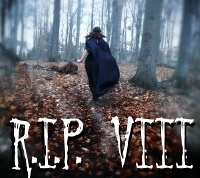 RIP has helped me become a fan of gothic novels and all their over-the-top melodrama. They’ve been a regular go-to since I don’t like real horror. Oh good, glad you’re enjoying it! I love Austen’s slightly snarky, self-aware narrative voice. And how fun is Mr. Tilney! Such a fun challenge – my 6th year! Have Fun! Diane it is. I always look forward to it and save my “scary” reading for this time of year! The Other is creepy! I read it long ago…..LOVE Northanger Abbey, it’s turning up on a lot of lists this year, too. Fun gothic and witty remarks from Austen 🙂 Enjoy the challenge, Stefanie! I say all the time that I should read Northanger Abbey. Maybe this year should be the year! What a great challenge, and one I will plan when I return from my summer holidays next week! If you enjoy an arctic based thriller, check out Michelle Paver’s Dark Matter. A lovely little ghost story…. Mrs. Madrigal, I read Dark Matter for last year’s challenge and I agree, a lovely ghost story! Yes, we need to immerse ourselves in gothic literature and try to convince ourselves that this UNGODLY heat is no longer here. 🙂 Needless to say, I’m not enjoying the current temps. I think its been over twenty years since I last read Northanger Abbey. The details are a little fuzzy for me as well. Or a lot fuzzy. Need to re-read it again one day. The Other does sound creepy. Really creepy. Great to have you back in RIP again. Let’s hope we are soon rejoicing in true Autumn weather. As ever, thanks for hosting such a great challenge every year. I do so look forward it. Melwyk, I know! It sneaks up on you doesn’t it?